Most of the the entrees I prepare for my clients are my own creations. Below are some of my recipes. I post recipes here from time to time so check back often. Contact me for more information about my recipes. Salmon is a wonderful, healthy option any time. The Dijon Orange glaze on this dish delicately enhances the sophisticated flavor of pan-seared salmon. 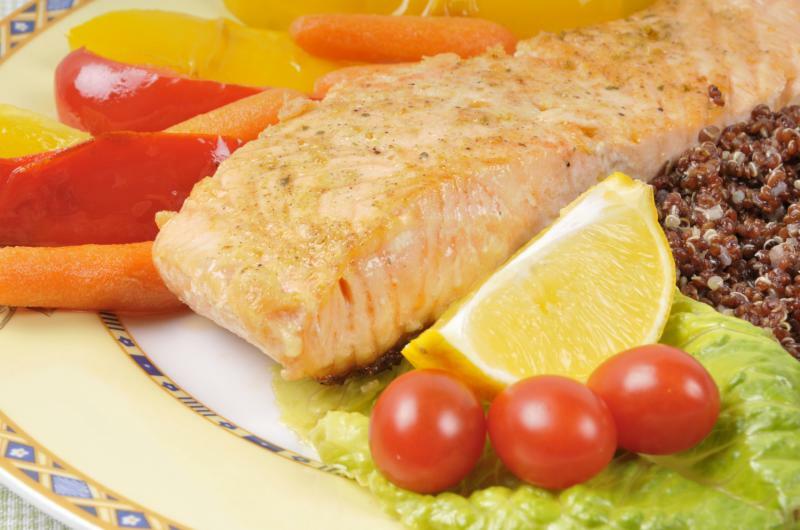 Always look for freshness - firm texture and no fishy smell - when shopping for salmon. I prepared this dish with Nerissa Knight of CBS 11 News. Sprinkle salt and pepper evenly on the salmon filet. Heat the olive oil in a medium saute pan over medium to high heat for three minutes. Pre-heat oven to 375 deg F.
Sear the salmon filet on both sides in the olive oil for 1-2 minutes per side. The salmon should have a nice crispy light reddish brown color when ready. Move the saute pan with the salmon to the oven to finish for 5-7 minutes. The fish should be firm to the touch when done. Remove from the oven and set aside to rest. Combine the glaze ingredients in a small sauce pan. Bring to a boil over high heat. Reduce to a simmer for 10 minutes over low heat. Glaze should be thick but pourable when done. After plating the salmon, drizzle the glaze evenly over the filet and serve warm. Quinoa is an ancient grain originally grown in the the Andes mountains of South America and revered as sacred by the Incas. Today it is prized as a healthy starch for its high protein content. I prepared this dish with Nerissa Knight of CBS 11 News. Heat the olive oil in a sauce pan over high heat. Saute the sliced onions and tomatoes in the olive oil for 1 minute. Add the dry quinoa and stir for 1 minute. Add the chicken stock, salt, pepper, and basil, and bring to a boil. Reduce heat to a simmer for 20 minutes or until liquid is incorporated. This is one of my favorite salads: tender baby romaine lettuce with a tangy raspberry vinaigrette dressing; simple, healthy, delicious. I prepared this dish with Nerissa Knight of CBS 11 News. Combine the romaine, onions, tomatoes, and bagel chips in salad bowl or platter. Wisk the dressing ingredients together in a bowl until well mixed. Pour the dressing over the salad and toss well. Serve on chilled salad plates.